In a previous post, I mentioned that I took The True Vitality Test, on The Blue Zones website and was jolted by my results. The test indicated that, based on my responses in December 2017, my predicted life expectancy is 88.9 years, and my predicted healthy life expectancy is 78.1 years. The third number, 97.5, is my potential life expectancy. As I get older, witnessing the aging of family members and friends, I have become acutely aware that I am only interested in extending my longevity if I can be as healthy as possible for those additional years. Upon seeing my results, my personal mission immediately became closing the gap between my life expectancy and my healthy life expectancy. I believe that I have a responsibility to optimize the gifts I have been given, so that I can add value while I am on this earth. To do that, I must take the best care of my body that I can. While my lifestyle already included many of the features that contribute to a long life of health and purpose, I knew there were refinements that I could make to close the gap. I am committed to continually monitoring my habits to ensure that I am doing the best I can to stay consistent and that I am getting back on course when life throws challenges my way. The mission of my coaching practice is to teach the lifestyle practices that help people live and age with power and purpose, while contributing to the creation of a healthier, more compassionate world. Essentially, I want to help other people close their gaps, too. Toward this end, I will offer an opportunity within the next several weeks designed to guide people on their journey toward living and aging with power and purpose. The key components of it are the pillars of my coaching practice and my own way of life. Mindfulness consists of a range of techniques for being present, managing stress, sleeping well and focusing energy in a healthy, proactive way. All the healthiest, longest-lived cultures in the world emphasize plant-based nourishment, which is one of the foundations of both my life and my coaching practice. Empowered movement combines physical activity and mindfulness to maximize the benefits of both. Because social connection is a vital part of living a long, healthy life, the opportunity that I will reveal allows participants to share the journey with others who are working to close their gaps. I am aware that it is impossible to control every variable involved in our length and quality of life; however, our daily choices do make a difference. It is within our power to cultivate habits that enhance our chances for living long, healthy lives. Personally, I believe that I have a responsibility to foster those habits and position myself as well as possible to add value in the world. This is my way of paying my debt of gratitude for the gifts I have been given. Stay tuned for more information on the upcoming opportunity Close the Gap opportunity. Meriam-Webster Dictionary defines “intention” as “a determination to act in a certain way” and “what one intends to do or bring about,” among other usages. Bringing intention to just about anything can enhance both the experience in the moment and the effectiveness and level of satisfaction induced by the activity. Several synchronistic encounters have generated a resurgence of interest in practicing intention in my everyday life. Here are a few of the ways I am doing that. Sleeping: Right before I go to sleep, as part of my nightly journaling practice, I set an intention to answer a question or solve a problem. I write it in my journal and ask my inner guidance to help me find the answer or solution. This sometimes leads to vivid dreams that steer me to a resolution. Other times, I awake with greater clarity or peace around the issue. Either way, I find that it is crucial to take a moment immediately upon awakening to record and process the guidance in my journal. Doing so contributes to deeper understanding and an increased chance of remembering and implementing what I learned in my sleep. Eating: Adding intention around eating can be life changing. For me, intentional eating manifests in many ways. First and foremost, I eat plants, not sentient beings. My primary intention behind doing so is to add to the compassion, as opposed to the suffering, that exists in the world. A bonus is that the most compassionate way of eating is also most life-enhancing for my own body. By eating whole plant foods, I am intentionally doing what is best for raising the level of compassion in the world and for optimizing my own wellness. Beyond this most critical intention, I have committed to checking in with my emotions before I eat, to consciously and thoroughly chewing my food and to putting my fork down between bites. It is amazing how this can transform eating from a function to a practice. It can be challenging to accomplish this in the midst of a hectic day, with lunch squeezed tightly between appointments, but I make every effort to maintain my intentional practices around eating even then. I find that it helps my body to be in a calmer, more peaceful state to accept the nourishment that I give it. This is a poignant reminder for me as I work toward some challenging goals. I also include on my rides affirmations designed to reprogram long-held beliefs that are not serving me. I find the combination of powerful physical activity that I love (cycling for me, but it might be something else for you) with positive self-talk and deep pondering of a worthwhile idea to be a particularly potent strategy for improving my confidence and my sense of well-being. I recently read the excellent book Healthy Brain, Happy Life, by neuroscientist Wendy Suzuki. She explained how a workout called IntenSATI changed her life. The creator of IntenSATI, Patricia Moreno, combined a fusion (dance, martial arts, yoga and interval training) workout with powerful affirmations. Suzuki found that the intention this brought to her exercise changed the way she thought about herself, her body and what is possible in her life. She noticed that her creativity was enhanced, and she was more willing to take reasonable risks in her work and social life. I related strongly to what she said. My experiences on the bike, particularly combined with positive messaging to myself, permeate every aspect of my life and bring me renewal on a regular basis. I am not necessarily successful at bringing intention to everything I do, but the areas where I do are more rewarding and help me to grow. In our highly distracted world today, the more intention we can introduce into our daily lives, the better. I believe that I have a responsibility to live my life with as much focus and purpose as possible so that I don’t miss the moments that comprise the whole of my existence. “How can I add beans to this?” Dr. Michael Greger asks himself at every meal. This is just one of several simple tweaks I have adopted since reading his new book, How Not to Die. I cannot overstate the value of this book and its companion app, Daily Dozen. Information about both is available at www.nutritionfacts.org. I absolutely loved the book and, although it was long, I was sad to see it end. This is a book that will stay with me for the long haul, however, because I have incorporated the lessons into my daily life. I have eaten a generally healthful diet for a long time, but HNTD gave me so many good ideas for easy, evidence-based tweaks. Since January 1, 2016, I have further optimized my nutrition with the very handy, free Daily Dozen app, available through Google Play Store and the App Store. Dr. Greger has dedicated his career to promoting health and wellness through nutrition. He introduces the book with the inspirational story of his grandma who was sent home in a wheelchair to die of heart disease when he was a child. She saw a 60 Minutes segment featuring Nathan Pritkin’s then-new lifestyle medicine center and traveled across the country to give herself one last chance by checking into it. After adopting Pritkin’s plant-based diet and beginning to exercise, she left death’s doorstep at age 65 to live a rich, full life, until she died at 96. Dr. Greger was so moved by his grandma’s amazing recovery that he vowed to become a physician and help people transform their own lives through the way they lived them. This wonderful book is the most well-researched, comprehensive nutrition and lifestyle book I have ever read . . . and I have read quite a few. Part One is a fascinating, detailed presentation of solid scientific evidence for using nutrition and lifestyle to prevent, fight and even reverse 15 leading causes of death: heart disease, lung disease, brain disease, digestive cancers, infection, diabetes, hypertension, liver disease, blood cancer, kidney disease, breast cancer, suicidal depression, prostate cancer, Parkinson’s disease and iatrogenic (caused by medical care) causes. Chapter by chapter, Dr. Greger highlights scientific studies in each of these areas and presents evidence illuminating the most health-promoting foods, as well as the riskiest ones, for each health condition. Then, in Part 2, Dr. Greger introduces his Daily Dozen, from which the app was born, and explains chapter by chapter why he strives to include each component in his day. I love this app and am using it every day. I truly believe that the adjustments I have made to achieve the Daily Dozen goals have taken my largely whole-food, completely vegan, diet to a new level of wholesomeness and quality. I am not perfect, but I do my best to set myself up to achieve each Daily Dozen objective. Beans: Dr. Greger makes a compelling case for consuming three daily servings of beans (including tempeh or tofu, which are soy foods). 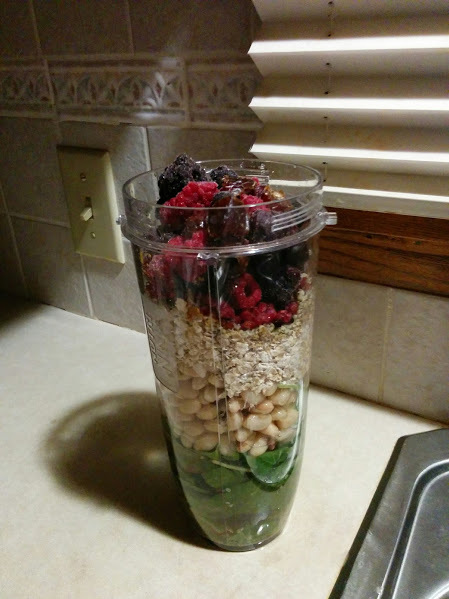 Toward this end, I have adopted the practice of adding some variety of bean to my morning smoothie. I put so many good things in there anyway, and beans add a wonderful creaminess. I also have simplified the lunches I pack for work: a variety of bean, a large serving of greens (heated together at work) and guacamole. It may sound boring, but it is wonderful . . . and simple. Other Fruits: Dr. Greger cites studies indicating that increased fruit consumption is correlated with better weight management. This is just one of many reasons he recommends three additional fruit servings per day. Cruciferous Vegetables: Sulforaphane is the component in cruciferous vegetables that earns them a separate category in the Daily Dozen. Dr. Greger presents persuasive evidence that sulforaphane is a cancer-fighter. It has been shown to have potential benefits for vision, nasal allergies, type 2 diabetes and autism. Broccoli, cauliflower, kale, bok choy and Brussels sprouts are just some of the tasty routes to accomplishing the daily cruciferous vegetable serving goal. Greens: I have added greens to my smoothies for years, and Dr. Greger presents many strong reasons to incorporate at least two servings of raw or cooked greens into our diets each day, on top of whatever cruciferous vegetable we are eating. I firmly believe, and Dr. Greger presents corroborating evidence, that these are some of the most healthful foods we can eat. Other Vegetables: Besides a serving of cruciferous vegetables and two servings of greens, eating two more vegetable servings each day will add a variety of other valuable nutrients to our dietary profile. Most of us have heard the recommendation to “eat a rainbow.” Dr. Greger explains that richness of color matters not just in greens, but in other fruits and vegetables, too. For instance, red onions have more phytonutrients than white onions, and sweet potatoes are more nutritious than white potatoes. Flaxseeds: Omega-3 fatty acids and lignans have been shown to be protective against cancer and to promote heart and brain health. Dr. Greger recommends a tablespoon of ground flaxseeds per day. I already made sure to include an Omega-3 source in my daily smoothie—flax, chia, hemp or walnuts—and now I include flax and possibly one of the others, but always flax, at minimum. Nuts and Seeds: Sure, nuts and seeds have a high fat content, but it is health-promoting monounsaturated fat. Because these foods are satiating, one serving a day can nourish us with healthful fat and protein, while lessening the chance of overeating less healthful foods. Herbs and Spices: Specifically, Dr. Greger recommends ¼ teaspoon daily of turmeric because of its documented ameliorative benefits for a host of conditions ranging from pulmonary disease to rheumatoid arthritis. This is easy to incorporate into my daily smoothie, if I am not going to be eating other foods that lend themselves to turmeric flavoring. Dr. Greger encourages the liberal use of most herbs and spices to add a range of phytonutrients, while minimizing the need for salt. Whole Grains: Dr. Greger promotes the consumption of three servings daily of whole grains because of evidence that they are associated with reduced risk for stroke, obesity, type 2 diabetes and heart disease. There are so many from which to choose, and Dr. Greger recommends eating a variety of different grains. Beverages: Water is high on Dr. Greger’s list, but he also presents evidence for drinking green, white, black and herbal teas. Green tea has particularly healing benefits. Dr. Greger acknowledges that hydration needs are quite individual and even vary within a given person, depending on weather and exercise conditions. However, he recommends five servings as a minimum each day. Exercise: Although not a food, exercise is part of Dr. Greger’s Daily Dozen because of its well-documented benefits for physical and mental health. Rather than sell the public short with his recommendation, he prefers to provide evidence for a relatively high dose of exercise daily. Especially during the cold, dark off-season from cycling, it is difficult for me to meet Dr. Greger’s exercise recommendations every day, but I give it my best effort, within the confines of real life. I remember the mantra from my graduate Exercise Science program, “Any exercise is better than no exercise, and, to a point, more is better than less.” I have lived this for a long time. Even if I can’t go for a bike ride every day, I exercise daily, and I love (often to my son’s frustration) to build in opportunities for exercise, like parking as far as possible from a store, taking the long way to or from the bathroom at work or walking, instead of driving, to a basketball game here in my small town. It all adds up. Besides his Daily Dozen, Dr. Greger promotes eating according to a “traffic light” system. Foods that get the green light—unprocessed plant foods—should be emphasized. Yellow-light foods are processed plant foods and unprocessed animal products. These foods should be minimized. Processed animal products and ultra-processed plant foods comprise the red-light category. These should be avoided completely. Dr. Greger defines “unprocessed” as “nothing bad added, nothing good taken away.” Ultra-processed plant foods have no redeeming nutritional value. His simple model is an easy way to make choices on a daily basis. He sees room for yellow-light foods to the extent that they promote consumption of more green-light foods. His example is his fondness for hot sauce that contains added salt. He eats more greens because he likes them with this hot sauce, so it has a place in his diet. While I have long emphasized unprocessed plant foods, I have taken that to a higher level after reading HNTD. For example, I am using dates in place of agave nectar or maple syrup when my smoothies need a sweetener. Dates are whole and unprocessed, while agave nectar and maple syrup are processed. Vegan yogurt (Daiya cherry!) is a treat for me. I eat more whole-grains and berries, as well as nuts and cacao nibs, when I eat it, so I have continued to eat it as an occasional treat, although it is a yellow-light food, since it is processed. The bulk of my daily food is unprocessed plant-based goodness, though, and this feels wonderful. Dr. Greger states that he is not promoting a vegan diet, so much as he is promoting an “evidence-based” diet. It just so happens that the diet that promotes health and minimizes sickness is also one that increases compassion in our world. He entered the plant-based world because of its demonstrated health benefits, but he has become a strong supporter of the ethics behind veganism over the years. I respected Dr. Greger’s work before reading HNTD, but I am a true fan now—so much so that I plan to become a regular donor to his foundation because it aligns with all of my most important core values: compassion, excellence, integrity and fitness. I will end this post with the quote that Dr. Greger used to conclude his book. Dr. Kim Williams, upon assuming the post of president of the American College of Cardiology in 2015, explained his rationale for eating a completely plant-based diet this way, “I don’t mind dying. I just don’t want it to be my fault.” I love that. We all have so much power to maximize our chances for a long, healthy life. Yet, so many of us abdicate our responsibility for our own well-being, relinquishing this power to genetics or chance or fate. Yes, things happen. Yes, we will all die of something. Yes, sometimes people who lead apparently very healthful lives die prematurely of cancer or heart disease or stroke. These things are all true, but it is also true that many more deaths and so much suffering could be prevented if we all took the steps Dr. Greger recommends in How Not to Die. His book is a tremendous gift in an immensely readable and highly accessible package. Please read it, adopt this lifestyle and save yourself, the animals and the planet in the process.